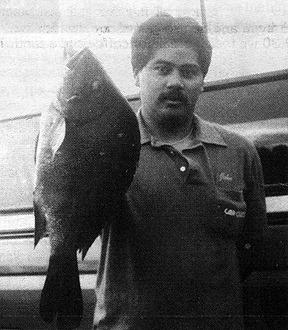 John Camero was fishing on the Hamakua Coast of the Big Island of Hawai'i when he landed the state record humpback snapper, a 7-pounder. John was shorecasting with a Daiwa BG 90 reel using 30-lb test on November 24, 1989 when he made his catch which was reported in the February 1990 issue of HFN (page 24). The fish was identified as locals as a to'au or blacktail snapper at the time, but many years later it was determined to be a humpback snapper by Dr. Jack Randall.